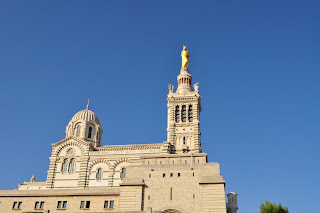 When we visited Marseille, France a few weeks back, we didn't expect its amazing beauty until we visited the Notre Dame de La Garde, a Romanesque-Byzantine basilica towering on the highest point of the city at 147 meters or 482 feet above sea level. This city landmark was built in the 19th century. Locals affectionately call it Bonne Mère (good mother) and it is topped by a 9.71-meter (32ft) gilded statue of the Blessed Virgin who is said to bestow protection on fishermen out at sea. The mosaics are particularly beautiful and the crypt offers a silent refuge for pilgrims. We arrived in time for the 10:00 am mass and it was a very solemn one. The numerous ex-votos, votive offerings to the Virgin, hanging in the nave bear witness to the pilgrim's faith and thanksgiving. It is on this same church when Karol Wojtyla, the future Popr John Paul II came here to pray to Our Lady in July 8, 1947. The site also affords a magnificent views of the city spread out at its feet, and of the bay, with the Frioul archipelago in the distance. The site is easily reachable by car or by bus. There is no admission fee to this holy place, and offers only priceless and valuable photographs and memories and a rich experience for the pilgrims and tourists alike.